The 2008 Presidential election in Zimbabwe caused great controversy in southern Africa. The presidential incumbent, Robert Mugabe, held the title since 1980 and ran for the second time against the opposition party, Movement for Democratic Change (MDC), and its leader Morgan Tsvangirai. What seemed as a normal election for the people of the Zimbabwe turned into confusion as the results were withheld for over a month by the Zimbabwe Electoral Commission (ZEC). When petitioned by the court to release the results, the ZEC called the vote in favor for Tsvangirai and the MDC. Mugabe and the ZANU-PF party called for a recount and the ZEC found that they could not call the first round a runoff. Before the 2008 election Mugabe's view had been that of a confident incumbent. He is even quoted to say "If you lose an election and are rejected by the people, it is time to leave politics" but after losing the first round to Tsvangirai, that optimistic view changes (BBC News). With seemingly only 47% of the vote, the ZEC was not able to call the election and the second round of votes would begin. After Mugabe and the militia began to use violence against opposition members in order to intimidate and ensure the second round of results, Tsvangirai dropped out of the election in order to protect his supporters. The results of that 2008 election are still unclear and the ZEC has lost creditability. Even Mugabe's willingness to use force against supporters of the opposition makes it hard to know for sure. Even though he faces scrutiny from the West, Mugabe will not allow forany outside organizations to come and proctor the second round of voting. In this paper, I will offer considerations for how to work the polling in the future and offer campaign ideas to legitimize the next election. 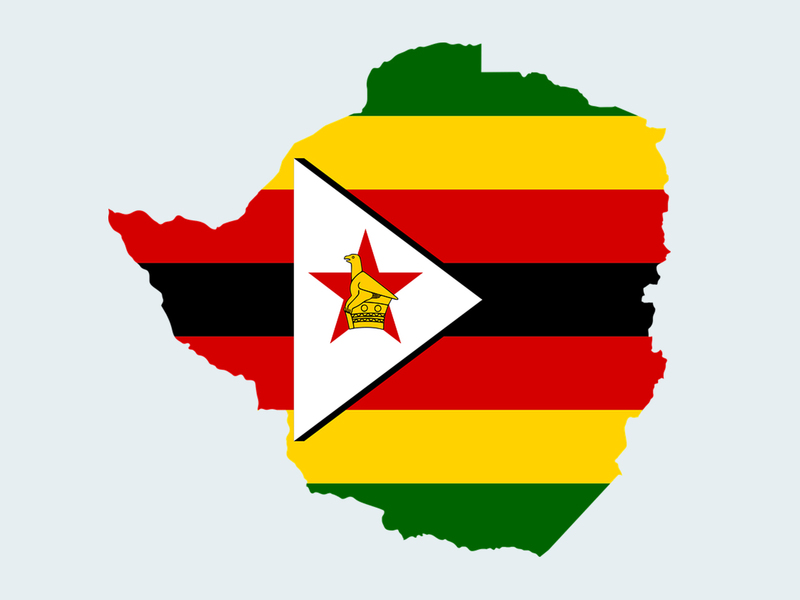 Zimbabwe is a landlocked country in southern Africa between South Africa and Zambia; it is also bordered by Botswana and Mozambique. Zimbabwe is a member of the African Union as well as the Southern African Development Community that provided oversight for the election. Zimbabwe was a colony of the United Kingdom up until 1980. In order to gain independence from the white minority, Mugabe used guerilla warfare tactics to take back Zimbabwe. Seen as a "revolutionary hero" Mugabe was able to seize power and has been in control of Zimbabwe in some form onward. The country is now a parliamentary democracy meaning that it has a President as well as a Parliament. However, Mugabe has been able to out the Prime Minister position and hopes that he can become president of Zimbabwe for life. Although it seems as if the conflict should be between the ZANU-PF and the MDC parties, I would like to argue that the conflict is actually between a tyrant and the people he failed. He has failed on his promises to protect the people by increasing their standards of living; he instead takes their and divvies it out amongst his elite friends give to his supporters. Zimbabwe is also supposedly a democratic state but when the other groups try to meet and gain some sort of leadership, Mugabe has the military and secret police shut them down. A month after the 2008 election, the New York Times reported that "truckloads of heavily armed police officers rounded up hundreds of people at the headquarters of Zimbabwe’s opposition party…as plainclothes investigators descended on independent monitors of the nation’s disputed elections…" while many people stood by and watched (nytimes.com). In order to make sure that he would win the second round of voting, Mugabe took members of the MDC from their jobs in broad daylight striking fear and setting a precedent for future elections. Now the opposition is in hiding and the results from that first election may never be seen. The conflict of not releasing the election results is a mix of social and political struggle. Zimbabwe's social conflict can be seen in the disparity between classes. Mugabe's willingness to use violence makes it hard for people to voice their opinion and oppose the ZANU-PF party. They are not able to use their freedom of speech or freedom to assemble. Mugabe makes it seem as if no one else will be able to become President. The people of Zimbabwe also believed that the majority party would help them against Mugabe or even a neighboring state but "both groups remain loyal to him" including the leader of South Africa (BBC News). Mugabe also attempted to amend the state’s constitution in order to allow himself unlimited terms. Mugabe is even believed to have coerced the Women's League to help his referendum pass through Parliament. In fact, a ZANU-PF central committee member said that during their presentation 'it was very obvious that the presentations by the women and the youth were carefully choreographed, and that Mugabe was aware of or behind the proposals to have him declared life president" (irinnews.org). Fortunately, his plan did not work. The government of Zimbabwe is made up of a President as well as a Parliament which are both elected by the people. The President is in office for two five-year terms (as of 2013). The President is "the Head of State and Government… [and the] Commander-in-Chief of the Defense Forces”, he also selects and chairs [the] Cabinet" (zimbabweelection.org). At the age of 89 in 2013, Mugabe decided to run for the presidency again even though it was leaked that he may or may not have pancreatic cancer. This was also around the same time that he announced his plan to become "president for life". Mugabe and the ZANU-PF party play the role of agitators in the conflict. Instead of consenting to Tsvangirai's 51% lead, the party would only have Mugabe as winner. It is also important to understand the majority party's beginnings in Zimbabwe. ZANU-PF started off as a militarist regime under Mugabe during the revolution against the British in 1980 as a conglomeration between the Zimbabwe African People's Union (ZAPU) and the Zimbabwe People's Revolution Army (ZIPRA). The ideology of the ZAPU party was cultivated by the communist ideals of the Soviet Union that supported them against the British. The party maintains the ideals of African nationalism and anti-imperialism. The MDC, or the Movement for Democratic Change started in 1999 by Morgan Tsvangirai as an opposing force to Mugabe's monopoly of power and the ZANU-PF (zimbabweelection.org). The MDC's website states that they were formed "…on the basis of carrying on the struggle of the people; the struggle for food and jobs; peace; dignity, decency and democracy; equal distribution of resources; and justice, transparency and equality of all Zimbabweans" (mdc.co.zw). Although the MDC has made strides within the politics of Zimbabwe, they still rely heavily on the support of the people. This proves a challenge when Mugabe uses pressure and fear to intimidate its supporters. Even though the people want topromote change, they also have to hide from Mugabe when he sends out the militia and the secret police to round up dissenters. I mentioned the tactics used by Mugabe after the first round of election results were handed out but now I would like to point to another source of intimidation tactics: torture camps. According to sources such as Human Rights Watch, after the 2008 election the ZANU-PF party is accused of "using a network of informal detention centers to beat, torture, and intimidate opposition activists and ordinary Zimbabweans" (hrw.org). Survivors of these camps have gone on to say that they were held in these camps for nearly three days , beaten with wooden planks and interrogated for information regarding MDC leaders, MDC funding, and the locations of other supporters of the MDC. This human rights violation is not hard to believe considering Mugabe's past acts of violence. More troubling is the fact that the Mugabe does not have a list of those men and women who voted for Tsvangirai and is seizing people they believe voted for the opposition. The MDC has made many attempts to oust Mugabe and the ZANU-PF party and have come close many times to achieving their goals but have not succeeded. As a member of the Zimbabweans for Free and Fair Elections, I would like to offer three considerations to think about before any tactics are used. First, we need to ask if the election results are valid anymore. We have seen what Mugabe has done and will do to anyone that opposes and challenges his power; we have even seen the violence he uses on people he suspects oppose his views. Admittedly, we cannot face Mugabe by ourselves and will have to reach out to our neighbors in the long run in hopes that they will be able to provide support and help. If we truly believe that the election results from the 2008 election will have a positive impact for change then we will need to enlist the help of an outside election monitoring group. Although the Southern African Development Community has been in charge of the oversight, I think that we need a group outside of southern Africa and should reach out to the U.N. to help. The U.N.’s Department of Political Affairs offers electoral assistance to all member states. Western countries, including the United States, have alosparked interest in this case. One long term plan should be an investigation of the Zimbabwe Electoral Commission and the Southern Africa Development Community. We know that Zimbabwe is not the only country in our area that has been affected by the SADC's failure to ensure fair elections. This investigation could offer help to future countries. Secondly, we have to consider Mugabe's willingness to use violence to intimidate members of the opposition. Because of this our tactics will have to avoid portraying Mugabe in any light. We will also have to figure out safe and secure ways of contacting supporters in Zimbabwe and around the world. We do not want to put any of our supporters in the way of Mugabe and his secret police. Lastly, we need to consider what a fair election in Zimbabwe could look like. We know that Mugabe is planning to run in 2018 even though he has surpassed the limits to his term. In regards to the first consideration, I do not think that the pressure should be placed on the government to release the election results because we are past that point. The ZEC and SADC should be scrutinized for their failure to provide results. Our short term goal should be to draft a campaign to discredit them. For example, members of the “Free and Fair Election” team could place phony election booths around the capital of Harare. Inside these booths would be fake ballots with only one option of 'corruption' to vote from. Members could also place already stuffed ballot boxes around the capital to symbolize the votes that the ZEC claims were lost in transit from the first round. In order to gain the awareness of the political corruption members could create videos to post on popular internet sites such as YouTube and Facebook. Videos of with acts of violence from the secret police or militia should also be filmed in order to hold the military responsible. We will later provide a video satirizing the election process itself. The theme of our campaign will be "Who Doesn’t like Corruption”. There are two goals to this campaign. The first goal is to show Mugabe and the ZANU-PF party that people of Zimbabwe will no longer tolerate corruption and that it is time for a fair election. Mugabe needs to understand that he cannot turn the results in his favor. The second goal is to offer the people hope that they can freely express themselves and use the freedoms their democracy allows for; they should be able to vote how they please and to better their situations. The theme of the campaign was made to provoke the people to think about their situations. When people really understand and begin to process what extremes their government has taken them to, they forget about the fear of retaliation and work for change. If you look to Tunisia and Egypt for example you will see where this rings true. The Tunisian people were colonized by the French who did not share their same religion. In Egypt, the people were able to oust the militarist regime as well as the religious regime the people did not agree with. There needs to be some sort of change in Zimbabwe. Although the focus is on the election results, I think that more people should be concerned about the regime in charge. At he next election in 2018, Mugabe will be 93 years old. He has single-handedly turned Zimbabwe’s government into a dictatorship under the guise of democracy. Moving forward there needs to be full support of regime change from the people. If they want to get out of their economic troubles or even take back their lands they will need to band together and demand change. If the campaign works, the people of Zimbabwe will be able to vote in a safe space. Along with the help of the U.N., the people will not have to watch their backs and hide from the militia and will be able to use their freedoms freely. "About Zimbabwe. "Zimbabwe Election Latest News on Voting Democracy.N.p., 07 May 2013. Web. 13 Mar. 2015. Dugger, Celia W. "Zimbabwe Calls for Runoff, but Opposition Challenges Vote Count." The New York Times. The New York Times, 02 May 2008. Web. 13 Mar. 2015. "MDC Profile. "Zimbabwe Election Latest News on Voting Democracy.N.p., 13 May 2013. Web. 13 Mar. 2015. "Mugabe Appoints ZANU-PF Lawyer as Zimbabwe Finance Minister." | Reuters. N.p., 10 Sept. 2013. Web. 13 Mar. 2015. "Our History. "Movement for Democratic Change.N.p., n.d. Web. 13 Mar. 2015. "World Socialist Web Site. "Zimbabwe: Referendum Defeat for Mugabe Shakes Zanu-PFGovernment -. N.p., n.d. Web. 13 Mar. 2015. "ZIMBABWE: ZANU-PF Wants to Make Mugabe President for Life." IRINnews.N.p., n.d.Web. 13 Mar. 2015.